Dr. Bebin is a member of the Department of Neurology and Epilepsy Center at the University of Alabama at Birmingham. Her primary research interest is Tuberous Sclerosis Complex (TSC). She serve as co-director of the UAB TSC clinic which is a comprehensive, multidisciplinary clinic for all ages. Currently, Dr. Bebein is involved in three NIH support clinical research efforts that are focused on TSC. For the past 20 years she has served as site PI for numerous pediatric antiepileptic clinical trials. She is a member of the Child Neurology Society Legislative Affairs Committee, Epilepsy Foundation of America Professional Advisory Board and member of the Board of Directors for the Tuberous Sclerosis Alliance. 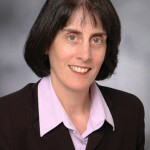 In 2013, Dr. Bebin was awarded the Tuberous Sclerosis Alliance Manuel R. Gomez award and her primary research interest is in the early identification of epilepsy in infants with TSC and antiepileptogenic treatment options. Tuberous Sclerosis Complex (TSC) was originally described in 1862. Clinicians’ understanding of this genetic disorder has evolved significantly over the last 150 years. It is a genetic disorder that can affect every organ system in the body and has significant variability in how it appears. The most common manifestation of TSC is the presence of benign tumors involving the skin, brain, kidneys, lung, and heart. These lesions may grow over time and cause clinical symptoms that deserve medical management and intervention when appropriate. Clinical symptoms associated with TSC can impact an individual’s quality of life. The lesions are most commonly associated with the brain resulting in seizures, developmental delay, intellectual disability, and autism. The disease manifestations of TSC can vary. The implementation of TSC genetic testing has made a significant impact in the accuracy of confirming the diagnosis, particularly in mildly affected individuals. Currently it is estimated that 1/6,000 to 1/10,000 live births and 1/20,000 individuals in the population have a diagnosis of TSC. In 1998, two genes were identified (TSC1 and TSC2) which are the basis of the manifestations of TSC. Both of these genes have the function of suppressing tumor growth in the body. They also regulate cell growth through the inhibition of a specific protein called mammalian target of rapamycin (mTOR). If there is a mutation in either TSC1 or TSC2 gene, cell growth is not adequately regulated (suppressed) which results in the clinical manifestations of TSC. TSC1 gene produces a protein named hamartin. TSC2 gene produces a protein named tuberin which must work together to regulate mTOR. The mTOR pathway plays a key role in every organ system in the body to regulate cell growth, protein synthesis and energy needs of the cell. The tumors that may develop in patients with TSC are not cancerous but can cause serious problems if not monitored. Per the TSC Consensus 2012 Guidelines recommendations, appropriate monitoring includes follow up visits to their physician and repeat imaging studies (i.e. MRI of the brain or abdomen, CT of the chest). Most individuals with TSC have a normal life expectancy. Major health complications can develop in the brain and kidneys if patients are not followed regularly by their physician for possible changes in their TSC health status. In TSC, any organ system can be involved and the health issues vary between infancy, childhood and adults. Because of this, it is essential that an individual’s health care is coordinated among the various medical specialists and a plan for transition from pediatric to adult medical care be implemented. How is the condition diagnosed? What are common symptoms? The diagnosis of TSC is based on the medical history, physical exam and family history of the patient. Family history should include medical history on three generations. Genetic testing is recommended for genetic counseling purposes or if the diagnosis of TSC is suspected but cannot be confirmed by physical examination and/or diagnostic imaging tests. If the diagnosis of TSC is suspected, it should be confirmed with a series of diagnostic tests which vary depending on the age of the patient and clinical symptoms. Because of the advances in ultrasound and magnetic resonance imaging (MRI), infants can now be diagnosed prior to delivery. This is especially important for families with TSC because it can provide early diagnosis and close follow up during infancy. An infant with TSC may present in the newborn nursery with a heart murmur, abnormal heart rhythm or heart failure. Upon closer evaluation by the cardiologist, an Echocardiogram may identify cardiac rhabdomyomas. In children younger than 3 years of age, an echocardiogram and electrocardiogram (ECG) should be obtained to evaluate the presence of cardiac rhabdomyomas and/or heart arrhythmias. In the absence of cardiac symptoms in adults, an echocardiogram is not necessary. However, an ECG is appropriate to monitor for any evidence of a cardiac rhythm disturbance. Also during the first months of life, the infant should be followed closely because of the risk for focal seizures and/or infantile spasms. Because seizures remain the most common neurologic symptom in TSC, it is important that parents of a TSC infant be instructed on the recognition of seizures. Seizures develop in 85% of individuals. More than 50% will have seizures that are not easily controlled with antiepileptic medication. An electroencephalogram (EEG) is also useful as a baseline assessment for epileptic seizures. 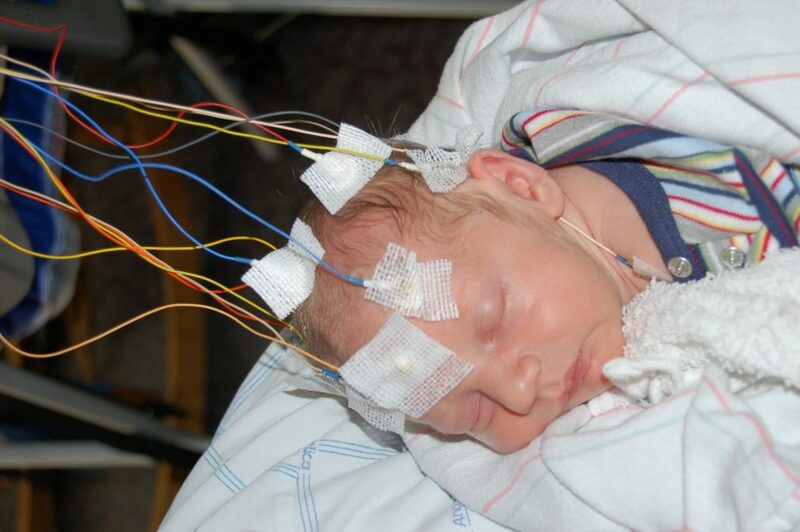 Based on the parents’ clinical history, the infant’s EEG findings and development, an additional 24 hour video EEG may be indicated for recognition of any subtle seizure activity. Early diagnosis of seizures and initiation of treatment can positively impact the child’s developmental outcome when compared to TSC children with poorly controlled epilepsy. An important area of consideration in young children with TSC is symptoms related to neuropsychiatric disorders. The term TAND (TSC-associated neuropsychiatric disorders) is now used to describe the clinical manifestations of brain dysfunction which is common is TSC. Symptoms include aggressive behavior, autism spectrum disorders, intellectual disabilities, and psychiatric disorders. All TSC individuals presenting with these symptoms should undergo a comprehensive assessment at the time the TSC diagnosis is made. This will provide guidance on appropriate treatment and interventions. This is important because 45-60% of individuals have intellectual disabilities which can vary in its severity. change in gait, mood or behavior, and seizure frequency. Evidence of these symptoms would prompt a visit to the primary care doctor and neurologist. Neuroimaging (i.e.-brain MRI) is important to obtain to evaluate for the presence of subependymal nodules, subependymal giant cell astrocytoma (SEGA), and cortical tubers. Once baseline imaging is obtained, it should be repeated every 1-3 years in asymptomatic individuals with TSC who are younger than 25 years. If there is evidence of a SEGA and/or evidence of ventricular enlargement on the brain MRI, the patients should be monitored for any change in neurologic symptoms and a repeat brain MRI may be clinically indicated. In young adults over 25 years of age and who have evidence of a SEGA on brain MRI, monitoring with a brain MRI for life because of the possibility of growth of the SEGA is important. Cortical tubers will be found on brain MRIs in approximately 90% of individuals with TSC. They are a type of cortical dysplasia in which the neurons fail to migrate to the proper area during brain development. The presence of cortical tubers is commonly associated with seizures and learning disabilities. There are a variety of skin changes associated with TSC. These changes may be the first symptoms that leads to the diagnosis. The earliest dermatologic features seen are hypopigmented macules (also referred to as ash leaf spots) which is present in 90% of individuals with TSC. They are commonly identified in infancy and are flat areas with less pigmentation that the surrounding area of skin. They can vary in size and shape and become more apparent with time as the skin acquires more pigmentation. When the skin is pale especially in infancy it is valuable to use a Wood’s lamp (ultraviolet light) when examining the skin; this will enable better visualization of the hypopigmented macules. Another type of lesion, typically found on the lower back or nape of the neck, is called a Shagreen patch. It appears bumpy, tough and will have the same coloration as the surrounding skin. They are usually present in 50% of individuals with TSC and become apparent in the first decade of life. Ungual fibromas are fibrous growths that develop around the nail bed on the fingers and toes. They are seen in about 20% of TSC individuals but are common in later life. Facial angiofibromas are commonly seen over the face and primarily involve the cheeks, nasal bridge and chin. These lesions usually become apparent as the child reaches 4 to 5 years of age and are present in 75% of individuals with TSC. Over time the facial angiofibromas increase in size and coloration. Similarly the fibrous cephalic plaque is present on the face usually along the hairline, forehead or scalp. They are flesh-colored, vary from soft to firm, and are present in 25% of TSC individuals. The renal manifestations of TSC are an important aspect of the condition. They can cause significant health issues if left undiagnosed or recommended medical management is not followed. There are two types of renal lesions that occur in patients with TSC. Angiomyolipomas (AMLs) are benign tumors composed of smooth muscle, adipose and vascular tissue. These tumors are found most commonly in the kidney but can occur in other organs. They are specific to TSC and fat containing AMLs are seen in 80% of TSC patients with fat-poor lesions being far less common. They occur in <1% of the general population. The most common and serious complication of renal AMLs is bleeding secondary to their vascularity. Because of the potential complications associated with these lesions, MRI imaging should be done at the time of diagnosis and every 1-3 years thereafter. When the AML is larger than 4 cm in diameter, it is more likely to cause symptoms such as blood in the urine (hematuria). Multiple renal cysts can be seen in patients with either TSC1 or TSC2 mutations. In patients with TSC2 mutations the polycystic kidney disease gene (PKD1) is adjacent on chromosome 16p13.3. In a small group of TSC patients, they have genetic mutations involving both TSC2 and PKD1 genes, thus presenting with manifestations of TSC as well as polycystic kidney disease. It is important to note that multiple small renal cysts can be seen in the adult general population and is not indicative of renal disease. It is rare that they require treatment. The pulmonary manifestations of TSC consists of progressive shortness of breath on exertion and recurrent pneumothoraces in adults. The lung changes found in TSC is referred to as Lymphangioleiomyomatosis (LAM). They consist of smooth muscle cells which infiltrate all the lung structures. Recent studies report that with increasing age the cystic pulmonary parenchymal changes consistent with LAM can be evident in up to 80% of women by the age of 40 years. The same changes are found in about 10-12% of men with TSC. Other pulmonary symptoms seen in patients with TSC include multifocal micronodular pneumocyte hyperplasia (MMPH) and clear cell tumor of the lung which is a benign tumor. MMPH does not have specific symptoms in TSC patients, but may be present in 40-58% of TSC patients. Because of the frequency of lung involvement in TSC, the most recent TSC Consensus Conference Guidelines recommended all women over 18 years of age have a chest computerized tomography (CT) and pulmonary function testing. TSC is a genetic disorder that can be inherited from one parent with TSC or is the result of a spontaneous genetic mutation. An individual with TSC has a 50% chance of passing TSC on to their children. Currently only 1/3 of the TSC cases are known to be inherited and the other 2/3 are the result of a spontaneous mutation. The two genes (TSC1 and TSC2) are responsible for TSC. When one of these genes are defective, cell growth in the body is not appropriately regulated which results in the various manifestations of TSC. The manifestations of TSC vary in many different ways. 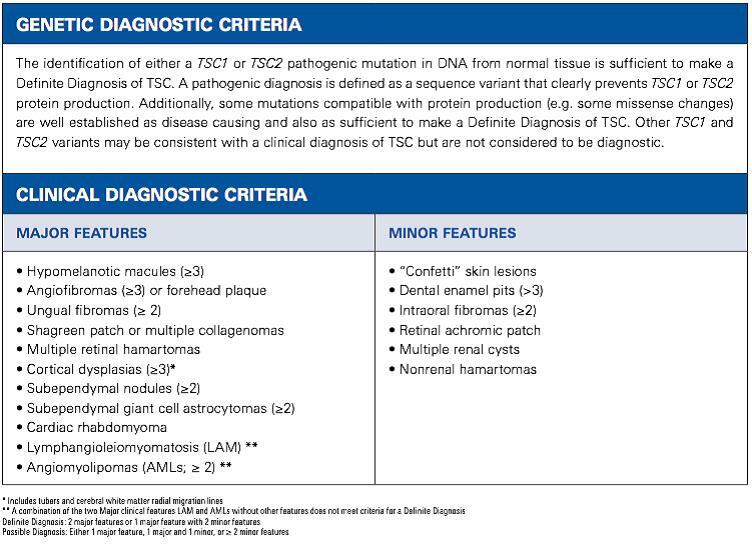 Physicians should follow the published TSC Diagnostic Criteria to confirm the TSC diagnosis. Individuals with TSC have a normal life expectancy and should be followed by their physician throughout their life in order to monitor for potential complications related to TSC. The identification of a TSC1 or TSC2 pathogenic mutation from genetic testing is sufficient to make the diagnosis of TSC. A pathogenic mutation in TSC results in an alteration of the function of the TSC1 or TSC2 proteins or prevention of protein synthesis. These changes lead to the various clinical manifestations TSC. Review of the individual’s family history to include three generations. Consultation with the genetic counselor is often helpful at the time of diagnosis. MRI imaging of the brain to evaluate for the presence of cortical tubers, subependymal nodules and subependymal giant cell astrocytoma (SEGA). Routine electroencephalogram (EEG) and review the medical history for any evidence of seizures. The physician will review the medical history and screen the individual for difficulties in learning, behavior, mental health concerns, and specific aspects of your development. Routine electrocardiogram (ECG) to check for evidence of an abnormal heart rhythm. A cardiac echocardiogram is beneficial to assess cardiac function and for evidence of cardiac rhabdomyomas (especially in children <3 years). Abdominal MRI to check for the presence of AMLs and renal cysts. Dermatologic examination to evaluate the various skin and dental findings associated with TSC. Ophthalmologic examination to evaluate for possible visual abnormalities or retinal changes. There are specific recommendations for individuals already diagnosed with TSC that have been published in the TSC Consensus Conference Guidelines (http://www.tsalliance.org/consensus) which summarize the frequency each aspect of a patient’s TSC should be monitored with an exam or follow up testing. ..
Genetic testing should be considered upon the diagnosis of TSC and consultation with a genetic counselor is beneficial if the individual with TSC is of reproductive age. Seizures, with the exception of infantile spasms, should be treated in a similar manner. An EEG should be obtained if seizures are suspected and a follow-up EEG recording based on seizure severity and clinical management. MRI imaging of the brain and abdomen should be done every 1-3 years based on the results of the previous imaging results. Consideration for more frequent brain MRI imaging is based on the presence of a SEGA and abdominal MRI in an effort to more closely monitor the progression of renal or non-renal TSC disease. Blood pressure checks and renal function testing should be done annually. Skin examination and full eye exam should be done annually if there is evidence of TSC changes. If there is evidence of a cardiac rhabdomyomas, an echocardiogram should be repeated every 1-3 years until the lesion(s) have stabilized or resolved. An ECG is also beneficial every 3-5 years to check for any abnormal heart rhythms. Individuals (primarily women) with TSC should be screened for shortness of breath on exertion at each visit. A high resolution chest CT (HRCT) should be completed every 5-10 years as a screening tool for LAM. For those that have been diagnosed with LAM, the HRCT should be done every 2-3 years to monitor for changes in the lung. Pulmonary function testing is also a useful diagnostic tool to evaluate lung function if respiratory symptoms arise. The most recent 2012 TSC Consensus Conference Guidelines provided updated recommendations for surveillance and management of individuals diagnosed with TSC http://download.journals.elsevierhealth.com/pdfs/journals/0887-8994/PIIS0887899413004918.pdf. Genetics– If not done previously, offer genetic testing and family counseling to individuals of reproductive age or newly considering having children. Brain- Obtain MRI of the brain every 1-3 years in asymptomatic TSC patients younger than age 25 years to monitor for new occurrence of SEGA. Patients with large or growing SEGA, or with SEGA causing ventricular enlargement but yet are still asymptomatic, should undergo MRI scans more frequently. These patients and their families should be educated regarding the potential of new symptoms. Patients with asymptomatic SEGA in childhood should continue to be imaged periodically as adults to ensure there is no growth. Surgical resection should be performed for acutely symptomatic SEGA. Cerebral spinal fluid diversion (shunt) may also be necessary. Either surgical resection or medical treatment with mammalian target of rapamycin complex (mTOR) inhibitors may be used for growing but otherwise asymptomatic SEGA. In determining the best treatment option, discussion of the complication risks, adverse effects, cost, length of treatment, and potential impact on TSC-associated comorbidities should be included in the decision-making process. Management strategies should be based on the TAND profile of each patient and should be based on evidence-based good practice guidelines/practice parameters for individual disorders (e.g., autism spectrum disorder, attention deficit hyperactivity disorder, anxiety disorder). Always consider the need for an individual educational program (IEP). Sudden change in behavior should prompt medical/clinical evaluation to look at potential medical causes (e.g., SEGA, seizures, renal disease). Obtain routine electroencephalograph (EEG) in individuals with known or suspected seizure activity. The frequency of routine EEG should be determined by clinical need rather than a specific defined interval. Prolonged video EEG, 24 hr or longer, is appropriate when seizure occurrence is unclear or when unexplained sleep, behavioral changes, or other alteration in cognitive or neurological function is present. Vigabatrin is the recommended first-line therapy for infantile spasms. Adrenocorticotropin hormone (ACTH) can be used if treatment with vigabatrin is unsuccessful. Anticonvulsant therapy of other seizure types in TSC should generally follow that of other epilepsies. Epilepsy surgery should be considered for medically refractory TSC patients, but special consideration should be given to children at younger ages experiencing neurological regression and is best if performed at epilepsy centers with experience and expertise in TSC. Kidney– Obtain MRI of the abdomen to assess the progression of angiomyolipoma and renal cystic disease every 1-3 yr throughout the lifetime of the patient. Assess renal function (including determination of glomerular filtration rate [GFR]) and blood pressure at least annually. Embolization followed by corticosteroids is first-line therapy for angiomyolipoma presenting with acute hemorrhage. Nephrectomy is to be avoided. For asymptomatic, growing angiomyolipoma measuring larger than 3 cm in diameter, treatment with an mTOR inhibitor is the recommended first-line therapy. Selective embolization or kidney-sparing resection are acceptable second-line therapy for asymptomatic angiomyolipoma. Lung– Perform clinical screening for lymphangioleiomyomatosis (LAM) symptoms, including exertional dyspnea and shortness of breath, at each clinic visit. Counseling regarding smoking risk and estrogen use should be reviewed at each clinic visit for individuals at risk of LAM. Obtain high-resolution computed tomography (HRCT) every 5-10 yr in asymptomatic individuals at risk of LAM if there is no evidence of lung cysts on their baseline HRCT. Individuals with lung cysts detected on HRCT should have annual pulmonary function testing (pulmonary function testing and 6-min walk) and HRCT interval reduced to every 2-3 yr. mTOR inhibitors may be used to treat LAM patients with moderate to severe lung disease or rapid progression. TSC patients with LAM are candidates for lung transplantation. However, TSC comorbidities may impact transplant suitability. Skin -Perform a detailed clinical dermatologic inspection/exam annually. Rapidly changing, disfiguring, or symptomatic TSC-associated skin lesions should be treated as appropriate for the lesion and clinical context. Treatments include surgical excision, laser(s), or possibly topical mTOR inhibitor. Teeth– Perform a detailed clinical dental inspection/exam at minimum every 6 months. By the age of 7 yr, panoramic radiographs should be conducted, if not performed previously. Symptomatic or deforming dental lesions, oral fibromas, and bony jaw lesions should be treated with surgical excision or curettage when present. Heart – Obtain an echocardiogram every 1-3 yr in asymptomatic pediatric patients until regression of cardiac rhabdomyomas is documented. More frequent or advanced diagnostic assessment may be required for symptomatic patients. Obtain ECG every 3-5 yr in asymptomatic patients of all ages to monitor for conduction defects. More frequent or advanced diagnostic assessment, such as ambulatory and event monitoring, may be required for symptomatic patients. Eye- Perform annual ophthalmologic evaluation in patients with previously identified ophthalmologic lesions or vision symptoms at the baseline evaluation. More frequent assessment, including those treated with vigabatrin, is of limited benefit and not recommended unless new clinical concerns arise. As an individual with TSC grows and matures, it is important to seek the medical advice of a TSC expert and follow the most recent medical recommendations for TSC surveillance and management. Because of the advances in medical care and early diagnosis of TSC, most people with TSC live a normal life span. It is important to stress the value of following the recommendations for medical follow-up in an effort to avoid the potential serious medical complications that can develop in TSC. Children with TSC have a higher than average risk for delays in their development and autism spectrum disorder. Therefore, it is helpful to discuss an early developmental evaluation with your primary care provider. The early TSC diagnosis followed by developmental interventions can have a positive impact on the developmental delays in children with TSC. It is also helpful to find educational resources which serve to improve the daily lives of individuals with TSC. The TSC Alliance provides educational information on an array of issues for TSC individuals and their families entitled Living with Tuberous Sclerosis Complex: http://www.tsalliance.org/pages.aspx?content=11. Autism Spectrum Disorder: a developmental disorder characterized by social deficits and communication difficulties, stereotyped or repetitive behaviors and interests, sensory issues and in some cases cognitive delays. Benign Tumors: Non- cancerous growths which in most cases do not metastasize. Cancer: Cancer develops when cells in a part of the body begin to grow out of control. Although there are many kinds of cancer, they all start because of out-of-control growth of abnormal cells. Cardiac rhabdomyomas: A benign tumor composed of muscle tissue that occurs in the heart. Computerized tomography (CT): A technique for creating images of the internal structures of the body. CT scans are formed from computerized imagery of many highly precise X-rays. Cyst: A closed sac containing fluid or semisolid material, developing abnormally in a body cavity or structure. Cysts can impair the function of surrounding tissue. Developmental delay: Delay in the normal cognitive and/or physical development of a child. Early intervention (EI): A federally mandated, state administered program that provides interventions for children age 0 to 3 years who have or who are at risk of having developmental delays. The programs usually include various therapies (physical, occupational, speech, etc.). Echocardiogram: A noninvasive test that uses high frequency sound waves (ultrasound) to produce an image of the heart. Electrocardiogram (EKG or ECG): This noninvasive recording of the electric activity of the heart shows if there are abnormal cardiac electrical impulses and/or rhythms. Epilepsy: When a person has had two or more seizures that have not been provoked by specific events such as trauma, infection, fever or chemical change, he or she is considered to have epilepsy. Facial angiofibroma: A benign tumor of the face composed mainly of blood vessels and fibrous tissue. Angiofibromas initially appear as pink or redbumps and can form a butterfly-shaped distribution around the nose, cheeks and chin. Genetic counselor: A trained healthcare professional educated in providing genetic risk and diagnostic information. Genetic counselors help individuals with genetic diseases and their families make medical and personal decisions based on their genetic information. Genetic disorder: A disease or condition caused by an absent or defective gene or abnormal chromosome. Hamartoma: A benign tumor in an organ composed of tissue elements normally found at that site but that are growing in a disorganized mass. Hypomelanotic macule: Skin abnormality featuring less color, or pigment, than normal. In TSC, hypopigmentation appears in the form of spots, or hypomelanotic macules, on any part of the body. These spots are benign and pose no physical threat. Infantile spasms: A severe type of seizure that typically occurs between the ages of 2 months and 2 years, although most children who develop this type of seizure are around 6 months old. It is identified by sudden jerks caused by muscle contractions, flexing of the body and neck and stiffening of the limbs. Each of these seizures lasts a very short time, but can occur in long or short clusters. If left untreated, infantile spasms can have a devastating effect on a child’s intellectual development. Lymphangioleiomyomatosis (LAM): A lung disease caused by mutations in the TSC genes that can occur in individuals with TSC, primarily women, or in sporadic cases. Cystic lung destruction leads to loss of lung function in LAM. Magnetic resonance imaging (MRI): A noninvasive system producing images of brain tissues by using radio waves and strong magnetic fields. MRI can detect tumors, tubers and other soft tissue abnormalities. mTOR inhibitor: A drug that inhibits the activity of a protein know as mTOR (mammalian target of rapamycin). Examples include sirolimus, also known as rapamycin or Rapamune®,and everolimus, also known as RAD001 or Afinitor®. Polycystic kidney disease (PKD): Polycystic means “multiple cysts.” In effect, PKD denotes multiple cysts on each kidney. These cysts grow and multiply over time, also causing the mass of the kidney to increase. Ultimately, the diseased kidney shuts down causing end-stage renal disease for which dialysis and transplantation are the only forms of treatment. PKD: Appears in two forms. Autosomal Dominant Polycystic Kidney Disease (ADPKD) is the most common, affecting 1-in-400 to 1-in-500 adults. Autosomal Recessive Polycystic Kidney Disease (ARPKD) is far less common, affecting 1-in-10,000 at a far younger age, including newborns, infants and children. Seizure: In normal brain function, tiny electrical charges pass from nerve cells in the brain to the rest of the body. A seizure occurs when the normal pattern is interrupted by sudden and unusually intense bursts of electrical energy that may cause strange sensations, emotions, behaviors or convulsions, muscle spasms and loss of consciousness. These unusual bursts are called seizures. Shagreen patch: Abnormal patches of skin resembling an orange peel, usually found on the lower back or the back of the neck. Shagreen patches may be present on other parts of the body as well. Subependymal giant cell astrocytoma (SEGA): A benign tumor found in the brain of individuals with TSC. SEGAs typically grow near or in the ventricles and can cause hydrocephalus (increased pressure in the brain) if they block the flow of cerebrospinal fluid (CSF). Subependymal nodule: A non-cancerous nodule (collection of cells) located along the edge of the brain’s ventricles. Subependymal nodules can grow into SEGAs, and some subependymal nodules become calcified (filled with a calcium deposit). Tuber: An area of the brain that contains a disorganized collection of abnormal cells; usually found in the outer layers of the brain called the cortex, but can be found in deeper areas of the brain. Tumor: Tumor is primarily used to denote abnormal growth of tissue. This growth can be either malignant or benign. Ungual fibromas: Benign fibrous tumors found in the areas around the fingernails and toenails. Wood’s lamp: An ultraviolet light used to detect hypopigmented macules in TSC, and used to diagnose other skin and scalp diseases. Chung TK, Lynch ER et al. Psychiatric comorbidity and treatment response in patients with tuberous sclerosis complex. Annals of Clinical Psychiatry 2011; 23(4):263-2659. Chu-Shore CJ, Major P et al. The natural history of epilepsy in tuberous sclerosis complex. Epilepsia 2010; 51,1236-1241. Krueger DA, Northrup H on behalf of the International Tuberous Sclerosis Complex Consensus Group Tuberous sclerosis complex surveillance and management: Recommendations of the 2012 International Tuberous Sclerosis Complex Consensus Conference. Pediatric Neurol 2013; 49:255-265. Northrup H, Krueger DA on behalf of the International Tuberous Sclerosis Complex Consensus Group (2013). Tuberous sclerosis complex diagnostic criteria update: Recommendations of the 2012 International Tuberous Sclerosis Complex Consensus Conference Pediatric Neurol 2013; 49:243-254. Roth J, Roach ES, Bartels U, Jozwiak S, Koenig MK, Weiner HL, Franz DN, Wang HZ. Subependymal giant cell astrocytoma:Diagnosis, screening, and treatment. Recommendations from the International Tuberous Sclerosis Consensus Conference (2012) Pediatric Neurol 2013; 49:439-444. 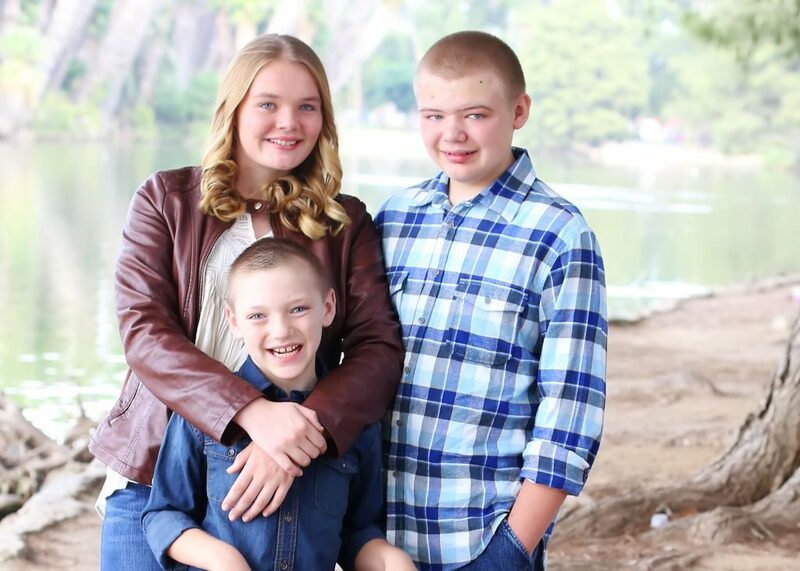 My name is Shannon Grandia and my three children and husband have all been diagnosed with Tuberous Sclerosis Complex. This is my story……. I was so excited to be a mom and soon after Rob and I got married, we decided to start our family. Rylee was born a beautiful healthy, baby girl, but at 18 months we found out that her “staring spells” were actually seizures and they were getting progressively more severe and began spiraling out of control. She was hospitalized and diagnosed with Tuberous Sclerosis Complex. At the time we had never heard of the disorder and had no idea what to expect. She had numerous calcifications covering her brain along with one distinct tumor, ash leaf spots on her skin, and focal seizures. Doctors told us the best case scenario is that she would not develop any more tumors and live a normal life with medication to control her seizures. Worst case scenario could ultimately lead to death. 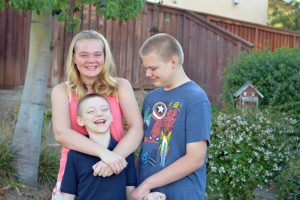 At the time, neither Rob nor I exhibited any signs of the disorder and we were told it was a “Sporadic Mutation.” This meant that is was unlikely any other children we had would have the disorder. Jake was born two and a half years later. At birth he was a happy, thriving baby boy. Rylee’s neurologist expressed it was doubtful Jake would have TSC, but they would monitor him when we brought Rylee in for her appointments. At a few months old we noticed a couple white spots on his skin, but were told it was a coincidence and he wasn’t showing any other signs of TSC. I am not sure how long we ignored the small “staring spells” Jake was having, but at 11 months old Jake was having a seizure every half hour and had to be hospitalized. He was soon diagnosed with Tuberous Sclerosis Complex as well. 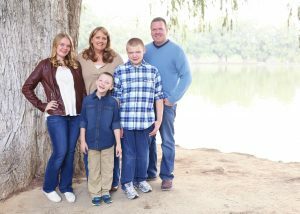 Jake had ash leaf spots, three distinct tumors in his brain and was having focal and complex partial seizures. Two children with TSC was a sign that either Rob or I had the disorder. After genetic testing it was determined that Rob had the TSC2 gene that was passed onto the children, his dad and brother were also tested and found to have the disorder. We did a lot of research and discovered there was a 50% chance of passing the disorder onto another child. A year went by and life was manageable. 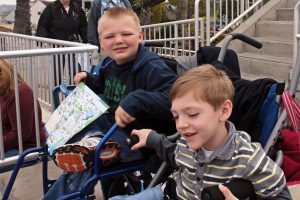 Both Rylee and Jake were hitting their developmental milestones, medication seemed to be controlling the seizures and both appeared to have more mild involvement of TSC. 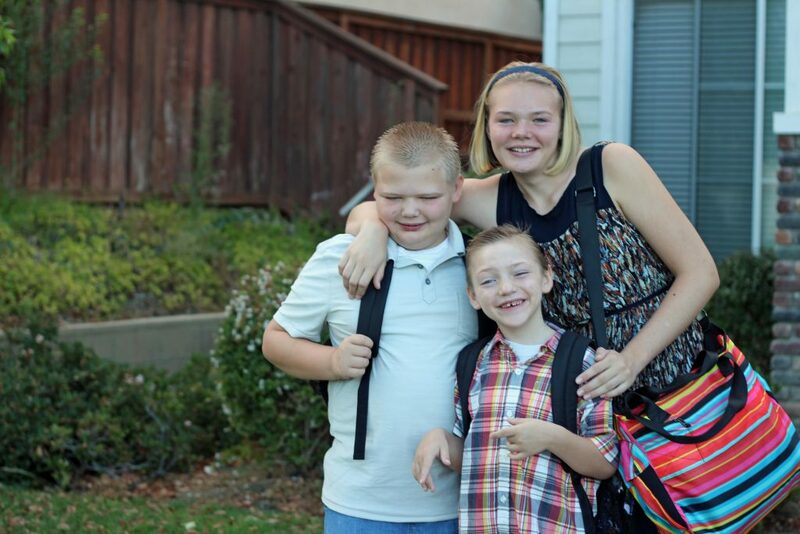 Since our first two children were born with TSC, we felt the odds were in our favor. Looking back, this may have been a naïve perspective, yet it gave us Luke. We did an amniocentesis with Luke to determine if he had TSC before he was born. When the call came in that Luke also had TSC2, we were devastated. Because of the diagnosis we did further testing and found out he had tumors in his heart. Luke already appeared to be more affected than Rob, Rylee or Jake. He came into the world three weeks ahead of schedule and spent the first two weeks of life in the NICU monitoring SVT’s of his heart and seizures. Luke spent more days in the hospital than out his first year of life. At one point he was having over 80 seizures a day and was close to comatose. He also had chronic pneumonia, RSV twice, asthma and further heart issues. Then at two and a half he was hospitalized for liver and kidney failure along with Pneumonia and the H1N1 virus. 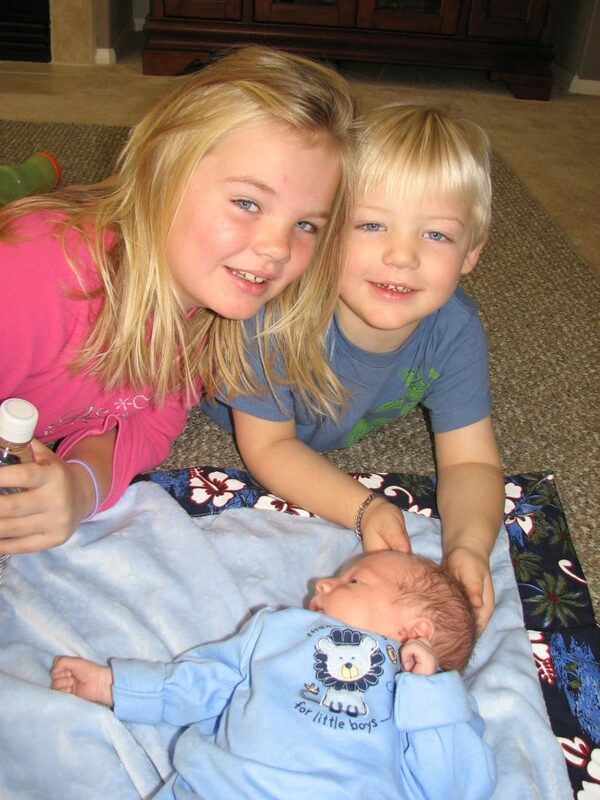 This was the closest we came to losing Luke and he spent almost three weeks in the PICU. This hospitalization also revealed that Luke was aspirating with fluids and received a GI tube for fluids only. With the focus on Luke, Jake’s behavior began to decline dramatically. At three years old he was no longer hitting developmental milestones, and was actually beginning to decline. Behaviorally, Jake was throwing constant tantrums and was extremely aggressive. Rylee was also having difficulty during this time. 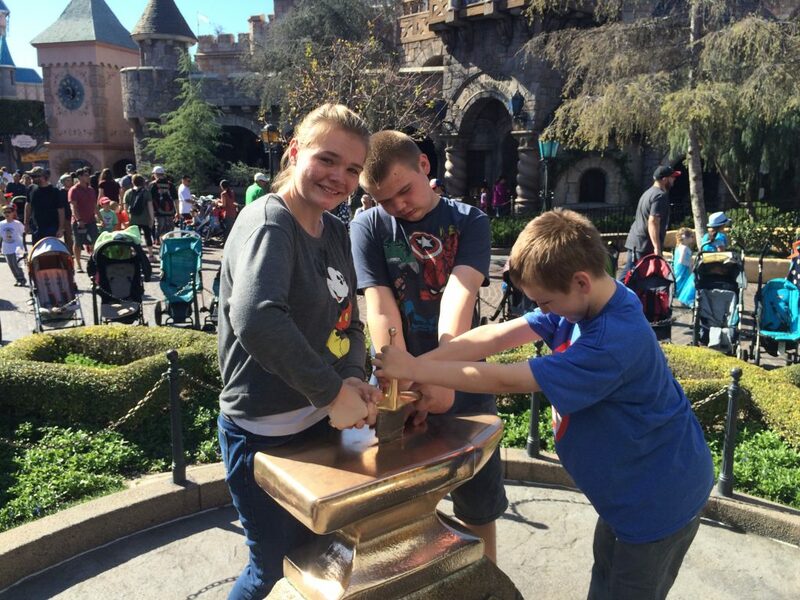 She was struggling academically, had weight gain from seizure medications and ADHD. This was an extremely difficult chapter in our life. Presently, we have lived with Tuberous Sclerosis Complex for over 13 years. Rylee is 14 years old and continues to have more mild manifestation. She still takes medication for seizures and ADHD. Ry will be going into high school next year and attends regular education, excited for the high school and college experience. 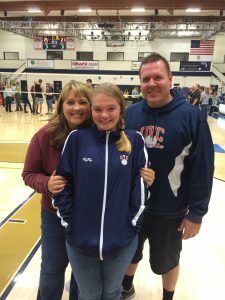 She is an athlete and loves playing volleyball, already making the freshman team at her high school and playing club. 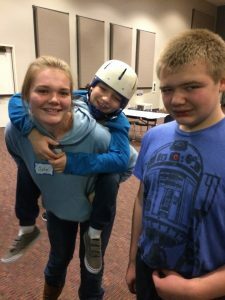 Ry’s compassionate heart and love of others continues to make her, her brothers’ biggest advocate and with each year Ry’s giving heart and constant smile reveals a young woman destined to make a difference. Jake is now 11 years old and has a diagnosis of developmental delay and autism. 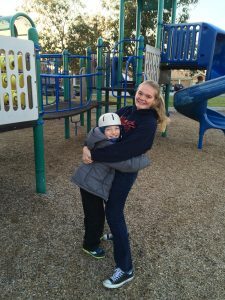 He still battles seizures, but they are controlled the majority of the time by medication. He also takes a concoction of medication for behavior and has developed tumors in his kidneys that we monitor closely. The behavior brings a whole new dimension to the struggles of TSC. 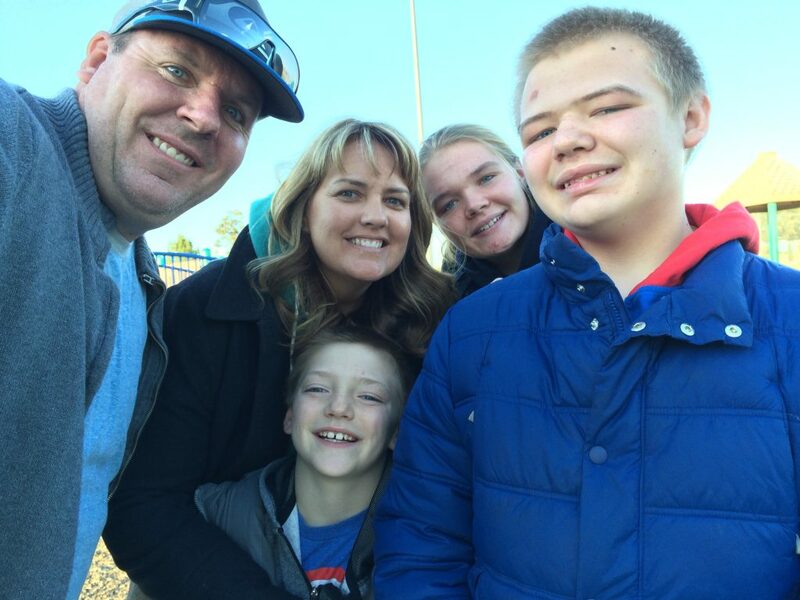 The special education department in our public school district did not know how to deal with Jake’s behavior and he is now attending a private school for children with disabilities. 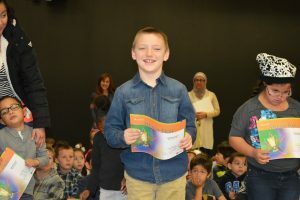 Getting Jake in a school that recognized his potential despite the behaviors has not been an easy road, but has shown us the need to follow our instinct and fight when necessary. Mostly, we are grateful for Jake’s smile and HUGE bear hugs. He is his brother’s constant protector/best friend and despite all Jake does not understand in life, he has a remarkable ability to show those around him how to simply be better. Luke is 8 years old and unfortunately we have been unable to get his seizures controlled. He averages 5 seizures a day (focal, complex partial and drop). This is the best seizure control he has had since birth complements of a special diet (Modified Atkins) along with a concoction of 5 antiepileptic drugs. 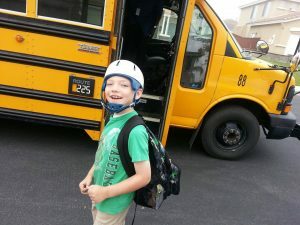 At this point Luke’s manifestations appear to be more medical than behavior, so he is able to attend a severe special day class in the public school system with a nurse to monitor his daily seizures and GI tube. 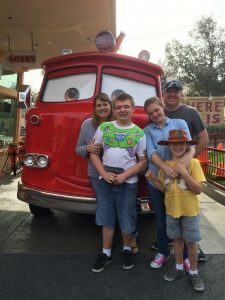 We were told when he was young that the severity and lack of control of his seizures would result in him never talking, walking or really having any kind of quality of life. If those doctors could only see him now. He LOVES school and trying to do EVERYTHING himself. Luke is probably one of the happiest kids you will ever meet and has everyone he encounters mesmerized by those bright blue eyes and HUGE smile. He not only talks (limited, but more every day and walks), he sings and dances every chance he gets. Sometimes when I think back to all he has been through, it doesn’t seem real (almost like a movie we watched rather than something we lived through). It is pretty incredible to get to witness the daily miracles! Rob and I take one day at a time and have no idea what the future holds for our children. Our prayer is that research continues to pave the way for a bright future filled with hope. It is miraculous to see how far the treatments and research have come since we first heard the term Tuberous Sclerosis Complex 13 years ago. Each one of our kids show us daily the definition of strength, perseverance and joy. I am so thankful to be their mom and Rob and I are excited at the possibilities that more research will bring. As I ponder these last 13 years and our journey with Tuberous Sclerosis and seizure control, I am humbled. Do I wish I had never heard the term Tuberous Sclerosis Complex or understood the wide range of seizures and the medication that control them? Yes! Have I been awestruck by the strength of my children, support of the community and the TS Alliance, and privileged that I get to be their mom? Most definitely! It is not an easy journey, but so very rewarding. Mostly, I have hope. The advancements in medication and treatments since we first began this road is incredible. I can only imagine what the next 13 years will bring. To those new parents with a newly diagnosed little one, I remember the fear and uncertainty that came with each diagnosis. The never ending questions that were running through my mind. What is Tuberous Sclerosis Complex? What do you mean it’s genetic? What organs does it affect? How many different types of seizures are there? What are the treatments? And most importantly, is my baby going to be okay am I going to be okay? As I have now traveled this journey for a few years, I can honestly say, you will be okay. I often hear, “You are so strong, I could never be as strong as you.” To this I simply respond, “It is not about how strong you are, it is about not having a choice and doing what you need to for your child.” Take one day at a time, one moment at a time. Focus on your child, focus on your family. It’s okay to admit you need help and it is okay to admit you are scared. In those moments allow those around you to lift you, encourage you and love you, you are not alone. Most importantly, know that those moments will pass and the miracle that is your child will show you how amazing life is. Tuberous Sclerosis Complex has taught me to celebrate each moment no matter how small, this has been one of my greatest blessings. Those moments that many people let pass unnoticed and uncelebrated, I recognize for the gifts they are. As each one of my children are traveling very different journeys with TSC, focusing on their smiles, allows my heart to know that no matter what they are impacting those around them and making this world a better place and for that I will be forever grateful! The Tuberous Sclerosis Alliance (TS Alliance) Support Community connects individuals, families, friends and caregivers for support and inspiration. This online discussion format is sponsored by the TS Alliance in partnership with Inspire. Inspire connects individuals, families, friends, caregivers and health professionals for health and wellness support. Inspire works with trusted health partners to build safe and secure health and wellness groups. Click here to go directly to the TS Alliance Online Support Community. The TS Alliance’s TSC Connect program (formerly the Support Network and Matching Program) is an organized partnership of individuals whose lives have been affected by tuberous sclerosis complex (TSC). The volunteers are committed to offering support and sharing their experiences with others who are faced with the challenges of TSC. TSC and Seizures: Did You Know? An easy-to-use tool to help patients and their caregivers keep track of medical appointments, symptoms, and test results, while enabling them to store useful information and questions to ask their doctor. 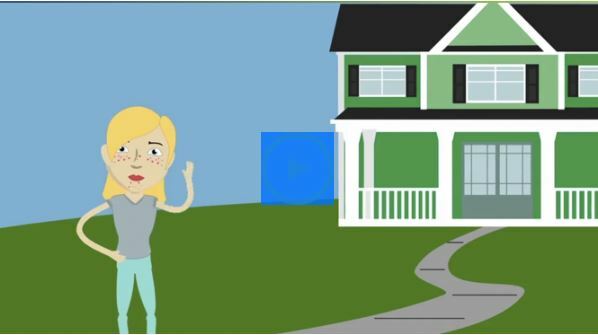 We follow the story of a fictional cartoon character, Ann—a teenager living with TSC—on her journey as she gains independence and transitions from pediatric to adult care. Tuberous sclerosis complex (TSC) is a genetic disorder that causes tumors to form in vital organs, primarily the brain, eyes, heart, kidneys, liver, lung and skin. Tuberous sclerosis complex (TSC) is caused by a mutation in either the TSC1 or TSC2 genes. Many babies with tuberous sclerosis complex (TSC) are now diagnosed before or soon after birth when rhabdomyomas (a type of heart tumor) are detected during routine ultrasounds. 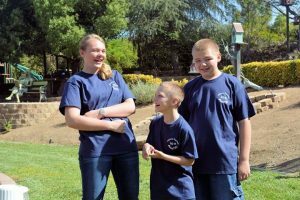 Tuberous sclerosis complex (TSC) affects everyone differently, even identical twins. Tuberous sclerosis complex (TSC) shows no gender bias and occurs in all races and ethnic groups. More common than Lou Gehrig’s disease (ALS) or cystic fibrosis, tuberous sclerosis complex (TSC) is far less known. Everolimus and rapamycin, which are used to treat some aspects of tuberous sclerosis complex (TSC), were developed thanks to scientists studying bacteria in the soil of Easter Island. A team approach to health care, with multiple specialists working together, can benefit people with tuberous sclerosis complex (TSC). Most people with TSC do not have access to this style of care. At least half of people with tuberous sclerosis complex (TSC) have normal intellectual ability, but they may still experience difficulties with neurological manifestations that affect their daily life functioning. Yearly blood pressure checks and urine tests are recommended for people with tuberous sclerosis complex (TSC) to monitor how well their kidneys are working. Tuberous sclerosis complex (TSC) affects more than <insert estimate> individuals in <country> and many more carers, families and friends who live with the impact of the disease. People with tuberous sclerosis complex (TSC) should see an ophthalmologist when diagnosed and annually thereafter to check for eye and vision problems. Research into cancer, autism, epilepsy and other diseases is benefiting from tuberous sclerosis complex (TSC) research. 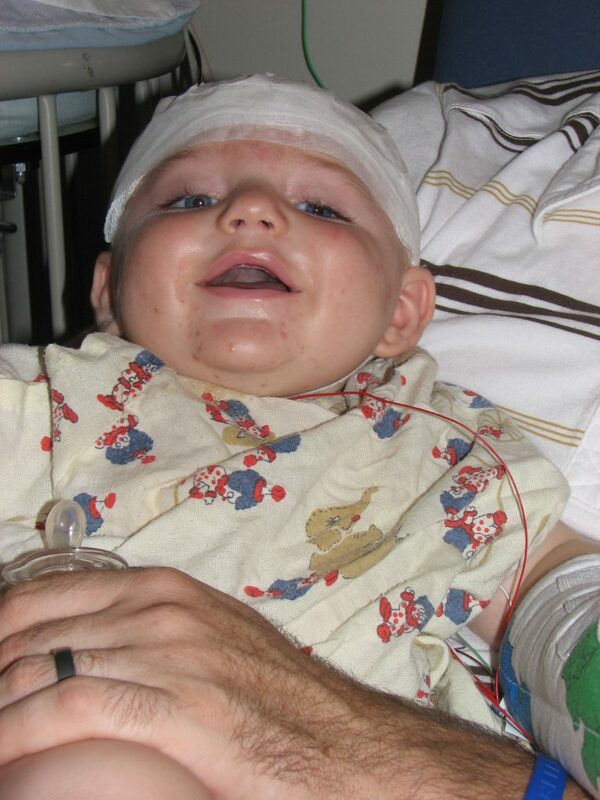 Around 1 in 6,000 babies born are affected by tuberous sclerosis complex (TSC). Worldwide, more than 1 million people have TSC. Every 20 minutes somewhere in the world a child is born with tuberous sclerosis complex (TSC). People with tuberous sclerosis complex (TSC) should have regular check-ups to monitor the disease and treat appropriately. Guidelines are available to describe the monitoring recommended by international experts in TSC. You can view these at www.tscinternational.org/documents/TSCi%20Consensus%20Guidelines.pdf. Magnetic resonance imaging (MRI) of the brain is recommended every 1-3 years until the person with tuberous sclerosis complex (TSC) is 25 years old. This is to look for a growth in the brain called a subependymal giant cell astrocytoma (SEGA) that can be life-threatening if left untreated. Tuberous sclerosis complex (TSC) is the most common genetic disorder associated with epilepsy and autism. Angiofibromas are raised red bumps that grow on the faces of people with tuberous sclerosis complex (TSC). 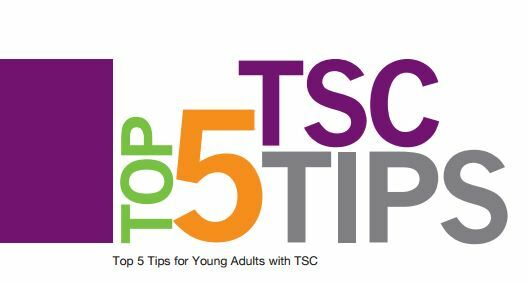 These generally appear by 5 years of age and affect up to 90% of individuals with TSC. Daily application of broad spectrum sunscreen is recommended by tuberous sclerosis complex (TSC) experts. This is because UV radiation contributes to forming angiofibromas, one of the signs of TSC on the skin. 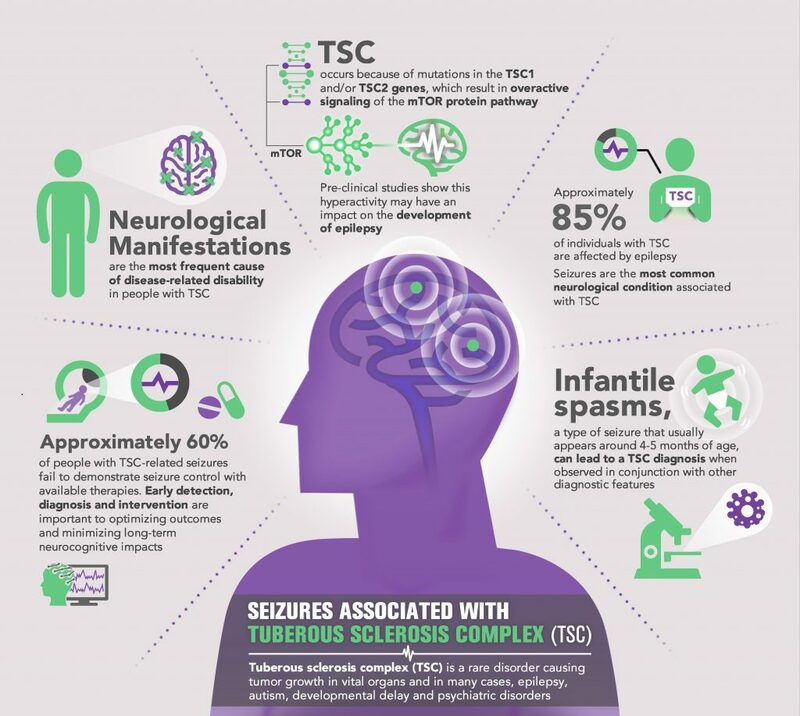 Seizures occur in approximately 85% of people with tuberous sclerosis complex (TSC), making epilepsy the most common brain manifestation of TSC. Very large mutations involving the TSC2 gene and adjacent PKD1 gene on chromosome 16 can lead to severe polycystic kidney disease during childhood. This occurs in less than 5% of people with tuberous sclerosis complex (TSC). Infantile spasms are a common type of seizure in babies with tuberous sclerosis complex (TSC). Vigabatrin is recommended by TSC experts as first line treatment, where available, to control these seizures. There is no cure for tuberous sclerosis complex (TSC). TSC International (TSCi) tuberous sclerosis complex (TSC) organisations work with local health care professionals to improve the care given to the 1 million people around the world living with TSC. Research in tuberous sclerosis complex (TSC) has already provided new treatment options for people with TSC. However, many people around the world do not have access to these medicines or the recommended surveillance for TSC. Almost half of people with tuberous sclerosis complex (TSC) will be diagnosed with an autism spectrum disorder. Up to 90% of people with tuberous sclerosis complex (TSC) will have tumors in their kidneys called angiomyolipomas. Regular MRIs are recommended to monitor these tumors and minimise complications. All people with tuberous sclerosis complex (TSC) should receive genetic counseling when diagnosed. Lymphangioleiomyomatosis (LAM) can occur in the lungs of people with tuberous sclerosis complex (TSC), almost exclusively in females. High resolution computed tomography is a test recommended for all adult women with TSC to test for LAM. June 1 is worldwide LAM awareness day.